With Pizza outlets starting everywhere in India few years back,I was introduced to a dish which I (didnt realise then)was going to stay in my recipe book forever. Whether eaten with soup or eaten with cheese and sun dried tomatoes as starter,Garlic bread is a crowd pleaser.My mouth is drooling as I am a bread lover and can eat bread even without seasoning. 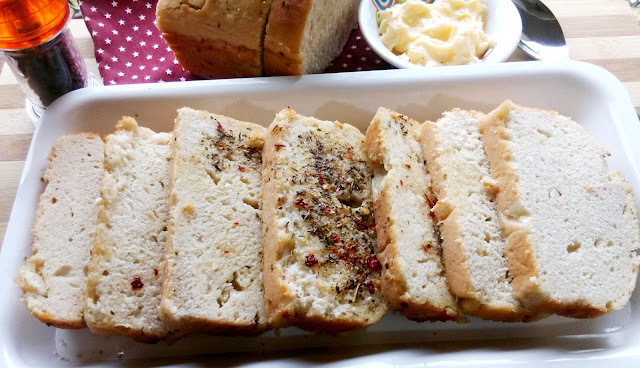 My kid doesnt eat garlic daal but give him this bread at anytime and the whole tin gets empty. Peel garlic cloves and roast them in a pan for one minute. Mash roasted garlic in a mortar and pestle and keep aside. Add sugar in water and stir.Now add dry yeast and keep aside at rest for 5 to 10 minutes.keep in warm place for yeast to bloom. Take a bowl and add flour,salt,extra virgin olive oil, mashed garlic and yeast mix to it. Add Lukewarm water and knead the dough very well for 5 to 8 minutes. Now place the dough in a greased bowl.Apply little olive oil on the dough and cover it with a dry kitchen towel. Keep the bowl in a warm place for two hours for dough to double up. After 2 hours take the dough and knead so as to remove air bubbles. 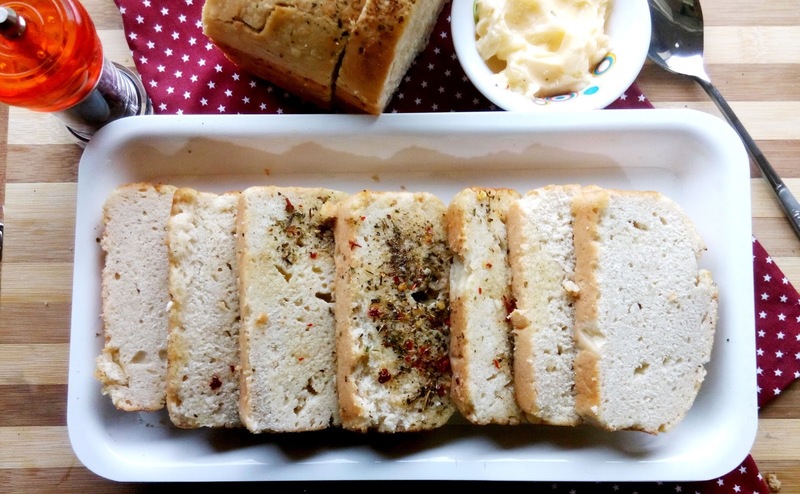 Make a log of that dough and place it in a greased bread tin. Cover the tin with towel and let it rest again for 30 minutes more. 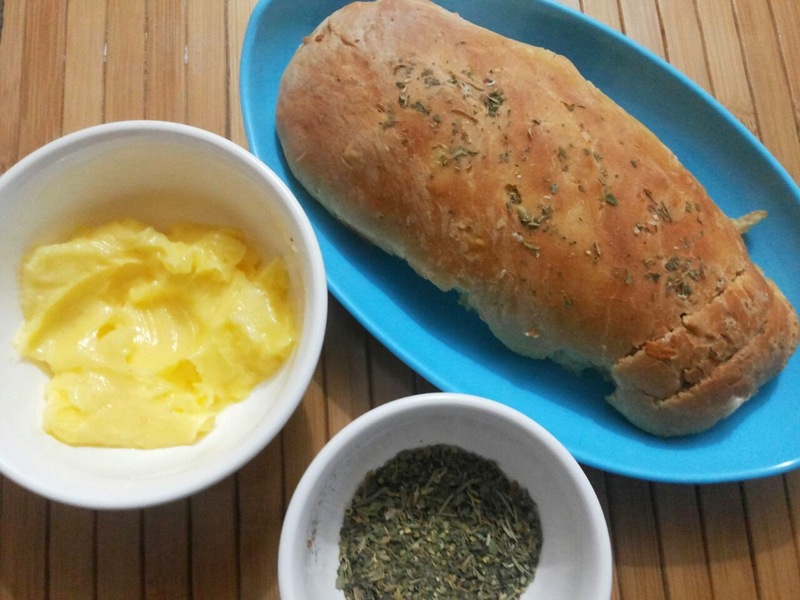 After 30 minutes,apply dried mixed herbs on the dough(donot knead now). Place the tin in a preheated oven(at 180 degree Celsius) for 30 minutes. Remove the tin after 30 minutes and let it cool on a wire rack. 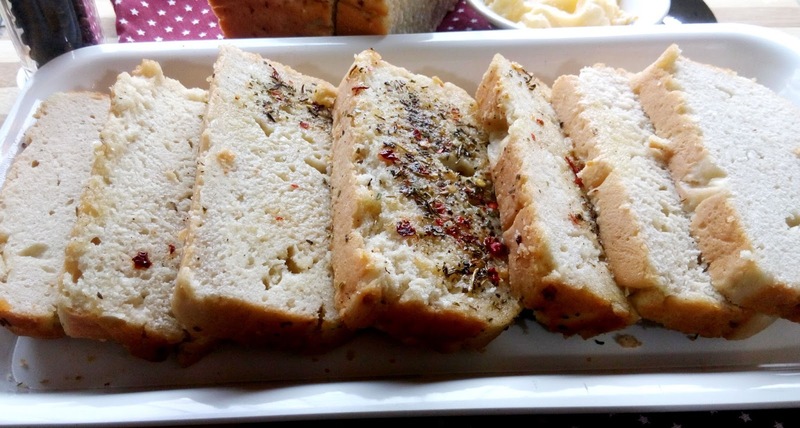 Serve the delicious loaf of bread with butter, cheese and toppings of your choice.